Twenge et al. (2018). Increases in Depressive Symptoms, Suicide-Related Outcomes, and Suicide Rates Among U.S. 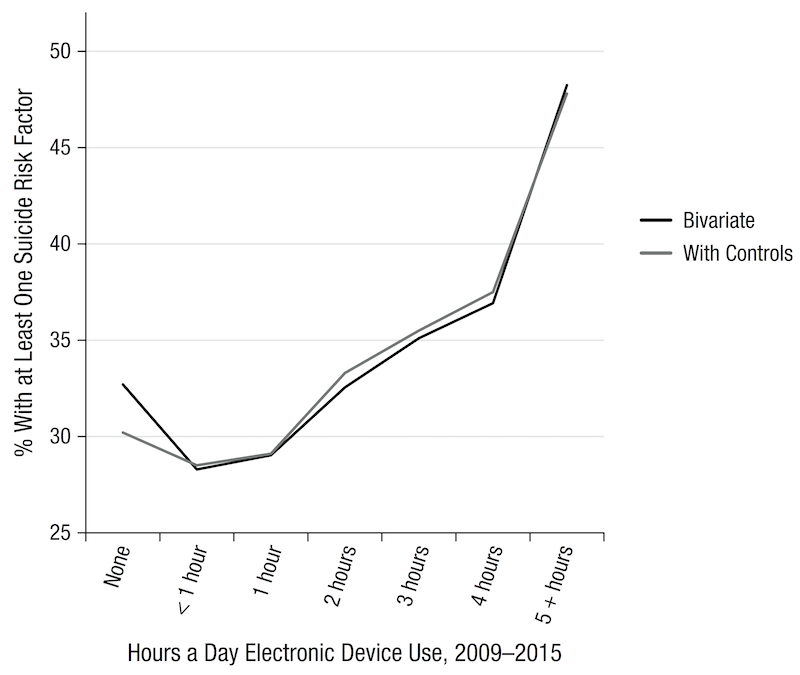 Adolescents After 2010 and Links to Increased New Media Screen Time. Badcock, P., Davey, C., Whittle, S., Allen, N., & Friston, K. (2017). The depressed brain: An evolutionary systems theory. Trends in Cognitive Sciences, 21, 182–194. Baumeister, R. F., & Leary, M. R. (1995). The need to belong: Desire for interpersonal attachments as a fundamental human motivation. Psychological Bulletin, 117, 497–529. Glozier, N., Martiniuk, A., Patton, G., Ivers, R., Li, Q., Hickie, I., Senserrick, T., Woodward, M., Norton, R., & Stevenson, M. (2010). Short sleep duration in prevalent and persistent psychological distress in young adults: The DRIVE study. Sleep, 33, 1139–1145. Hysing, M., Pallesen, S., Stormark, K. M., Jakobsen, R., Lundervold, A. J., & Sivertsen, B. (2015). Sleep and use of electronic devices in adolescence: Results from a large population-based study. BMJ Open, 5(1), e006748. Johnston, L. D., Bachman, J. G., O’Malley, P. M., Schulenberg, J. E., & Miech, R. A. (2016). Monitoring the Future: A continuing study of American youth (8th- and 10th-Grade Surveys), 2015 (ICPSR36407). Ann Arbor: Institute for Social Research, The University of Michigan. Joiner, T. E. (2005). Why people die by suicide. Cambridge, MA: Harvard University Press. Lieberman, M. (2013). Social: Why our brains are hardwired to connect. New York, NY: Crown. Newcomb, M. D., Huba, G. J., & Bentler, P. M. (1981). A multidimensional assessment of stressful life events among adolescents: Derivation and correlates. Journal of Health and Social Behavior, 22, 400–415. Oishi, S., Kesebir, S., & Diener, E. (2011). Income inequality and happiness. Psychological Science, 22, 1095–1100. Sherman, L. E., Minas, M., & Greenfield, P. M. (2013). The effects of text, audio, video, and in-person communication on bonding between friends. Cyberpsychology: Journal of Psychosocial Research on Cyberspace, 7(2), article 3. Song, H., Hayeon, S., Anne, Z.- S., Jinyoung, K., Adam, D., Angela, V., . . . Mike, A. (2014). Does Facebook make you lonely? A meta analysis. Computers in Human Behavior, 36, 446–452. Tromholt, M. (2016). The Facebook experiment: Quitting Facebook leads to higher levels of well-being. Cyberpsychology, Behavior, and Social Networking, 19, 661–666. Van Orden, K. A., Witte, T. K., Cukrowicz, K. C., Braithwaite, S. R., Selby, E. A., & Joiner, T. J. (2010). The interpersonal theory of suicide. Psychological Review, 117(2), 575–600. Zhai, L., Zhang, H., & Zhang, D. (2015). Sleep duration and depression among adults: A meta-analysis of prospective studies. Depression and Anxiety, 32, 664–670.